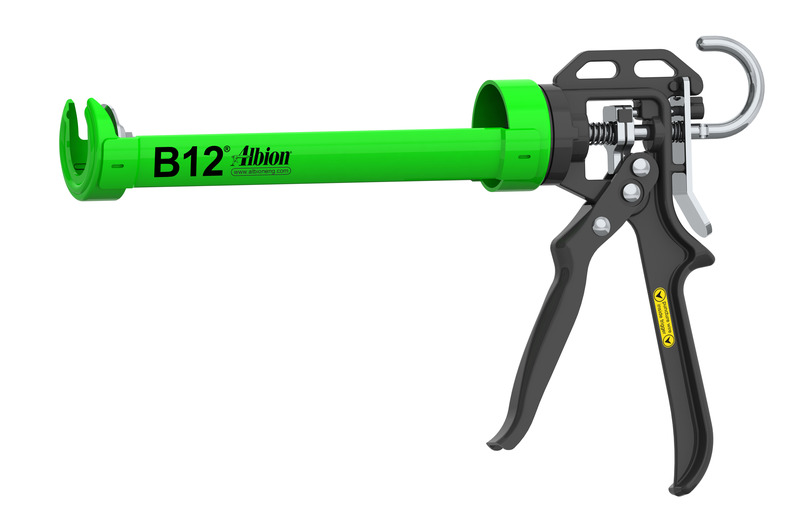 Albion smooth rod 12:1 thrust ratio caulking and sealant guns are meticulously designed to operate very smoothly by dispensing a variety of high viscosity sealants like auto urethanes and construction sealants even during cold weather. The caulk gun strap frame revolves to move the nozzle tip where needed. The spring-release plunger allows you to load and dispense silicone, acrylics and polyurethane sealants quickly and easily. The thumb-activated instant pressure release button prevents sealant run-on which can save you money over time. The Albion B12 one tenth gallon caulking and sealant gun includes a built-in ladder hook for your convenience and safety.